🇺🇸 Thank you for reading. Tell friends to follow along by signing up here. Axios Edge, Felix Salmon's must-read weekly note covering the big stories that will drive the business world, launches this Sunday. Sign up here. Axios Autonomous Vehicles, a weekly analysis of autonomous tech, and its impact on cities, policy and the economy, launches Friday, September 21. Sign up here. Verizon is betting its future on 5G, and executives tell Axios that includes a more aggressive push to focus its media brand Oath on building over-the-top (OTT) brands with a lot of live streaming content. Why it matters: Oath chief Tim Armstrong is reportedly on his way out, raising questions about Verizon's media arm and the company's overall media ambitions. For months, Armstrong pitched Oath's advertising potential as its focal point, but it has thus far failed to turn that business into a serious ad competitor to Google or Facebook. But Armstrong's exit, combined with Verizon's repeated denial of interest in buying a linear TV network and the sunsetting of its video platform go90 this year, makes some industry experts bearish on Verizon's commitment to its media business. The other side: Verizon Wireless group president and EVP Ronan Dunne tells Axios that the rumor mill is missing the bigger picture. He says Oath will provide fertile ground for the company to deliver immersive experiences through 5G, which will in turn help it drive engagement and bundle its services, as well as build custom brand experiences that it can sell as a business to consumer service. Dunne says that RYOT, the entertainment studio within Oath, will soon be one of the first parts of Oath to reap the benefits by 5G, creating new forms of storytelling that can be distributed on the high-speed network. 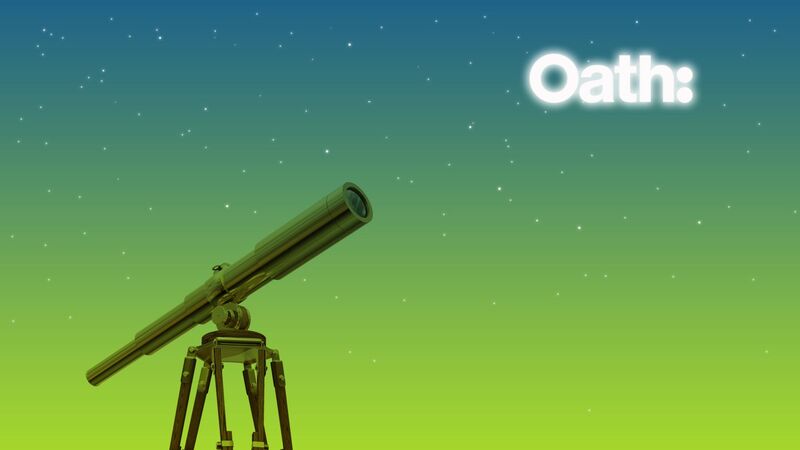 Sources at Oath say that the company is now looking to push Oath brands to do more live-streamed OTT programming. Last month, Axios reported that Yahoo Finance will be the first of its brands to create a full 8-hour day of live programming. Sources say that other brands are in the process of following suit. The company is placing its live bet on sports, in particular, given the application opportunities for immersive technologies (driven by 5G connectivity) to be deployed alongside games through Yahoo Sports, one of its more successful media brands. But even with high ambitions, Verizon still has a long way to go in deploying its 5G capabilities at scale and it's unclear how its multi-billion investment in Oath will evolve without Armstrong at the helm. The big picture: Verizon executives have repeatedly denied interest in acquiring CBS, or any other linear television network to help build out its live content portfolio. But one source familiar with their thinking says never say never. Moonves' departure comes amid a whirlwind of executive exits this week, Axios' Dan Primack reports. 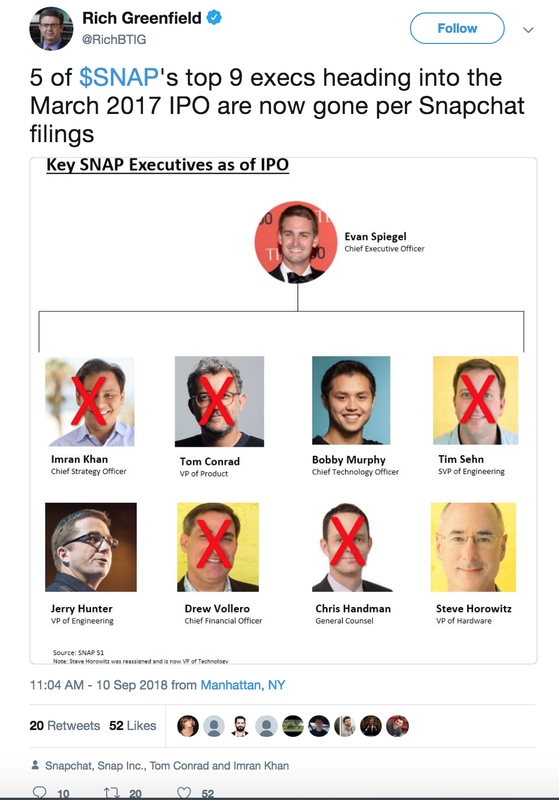 Analyst Rich Greenfield tweeted the chart above, looking at Snap's departures. Jack Ma will step down as Alibaba's executive chairman, Tim Armstrong is most likely on his way out of Verizon, and Imran Khan is resigning as chief strategy officer of Snap. RCS Messaging takes features from a bunch of messaging platforms, like text, video cha and audio file sharing. It creates a seamless messaging system across devices, operating systems and wireless providers — (like Samsung, LG Electronics, and AT&T) — that could compete with the likes of iMessage, Facebook Messenger, WeChat or Whatsapp. Quartz, the business news site recently acquired by Japanese media company Uzabase, is launching "Correspondence by Quartz," a news bot that will be embedded in Samsung’s rich messaging service (see above). Why it matters: It gives Quartz access to distribute its news content to millions of new people globally. And it's Samsung's first big push into global news through its rich messaging platform. (It currently has CNN as a domestic-only news partner). For now, the bot will be distributed only to Samsung customers with AT&T, but Samsung is working to expand that partner set in the upcoming months. Quartz has been building all sorts of bots for years through its in-house bot studio, including commercial bots for clients. It first gained attention for its bot efforts when it relaunched its app in 2016 to feature only one-to-one text communication between users and bots. It's since launched bots on its site and on various social media platforms. Even its Amazon Alexa flash briefing is hosted by two bots. The bottom line: Quartz, like The New York Times and others, believes the future of a sustainable news business model includes service journalism, or opportunities to make readers' lives better or easier, according to Emily Withrow, director of Quartz's bots studio. It's using customizable services, like bots, to do that. Instagram is building a standalone shopping app, The Verge reported last week. With millions of users and an effective ad format, it could be the next big thing in e-commerce. Why it matters: Instagram and other social media apps are becoming disruptive e-commerce players, mainly because they are able to leverage social data to better understand and cater to users' interests. "The idea of social commerce as a subset of e-commerce hasn’t been something many brands have focused on ... But there's clearly a big push going on to give consumers more engaging experiences and more compelling ways to connect with brands ... Social media is good at delivering those experiences because they have sophisticated user data." The latest ... Pinterest announced that it passed 250 million monthly active users yesterday, a growth point that seems in line with its booming sales, up 58% year over year, per Bloomberg. Snapchat and Facebook are both beginning to roll out ads that feature augmented reality, giving marketers the ability to let users virtually test their goods before buying them. Alibaba, China'e e-commerce titan, is already incorporating social experiences to its Taobao platform, offering the chance to message and video chat with merchants and other consumers, Axios' Steve Levine notes. Amazon has even launched Spark, a shopping social network app. that allows members to showcase and purchase products on its platforms, per Reuters. Joe Biden has signed a deal with the progressive millennial-focused website, ATTN: to host their new steaming show on IGTV (Instagram's new long-form video app). Why it matters: He follows other Democratic politicos who are jumping into the media fray, hoping to win the attention of millennials ahead of the midterm elections and beyond. Barack Obama will produce a range of shows, from unscripted series to documentaries, Netflix announced in May. Bernie Sanders hosts an interview show called “The Bernie Sanders Show,” that he started streaming over Facebook Live on a semi-regular basis, the New York Times reported in April. Their efforts are being mirrored by Hollywood influencers, whose fervor for this year’s midterm elections rivals that of recent presidential campaigns, according to The Washington Post. The bottom line: From Axios' political reporter Alexi McCammond ... "Most young voters would never expect to see a politician on IGTV. But Democrats think their key to winning the 2018 midterms is turning non-voters into voters, so they’re trying everything this cycle." Ratings for NFL broadcasts have generally been in decline, but the league still drives more viewers than most TV programming, having owned 37 of the top 50 most-watched programs in 2017. This season's Sunday openers saw strong ratings on Sunday’s opening day games, while the primetime matchup saw a slight dip, per Yahoo Sports.